This week I have been working on my Mermaids. The quilting is finished and now for the finishing touches! Hope to be sharing a Friday Finish soon! Do you ever get the urge to make something just for fun? Table runners are great for that! My recent happy mail was particularly exciting! 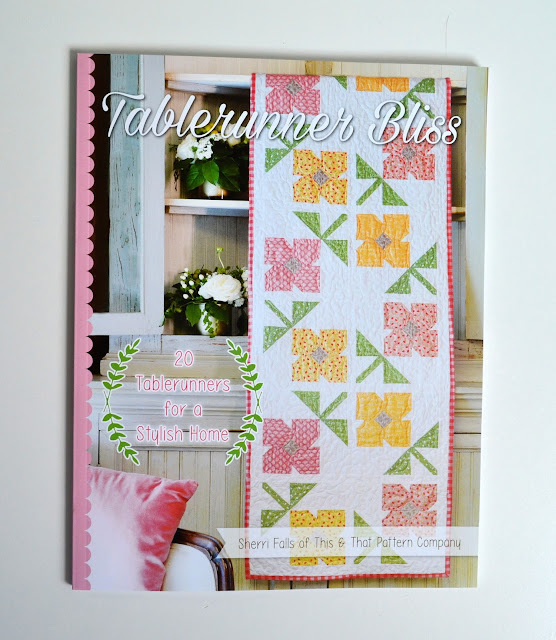 I received this in the mail because I am taking part in a blog hop promoting this new book: Tablerunner Bliss by Sherri Falls. I get to make 2 of the 20 patterns available and look forward to sharing them with you really soon! Most of the quilts I make are made to test the patterns I dream up. But this little quilt and matching pillowcase were made just for the sake of making. I am seeking to use up some of the fabrics I have had lingering in my stash this year. 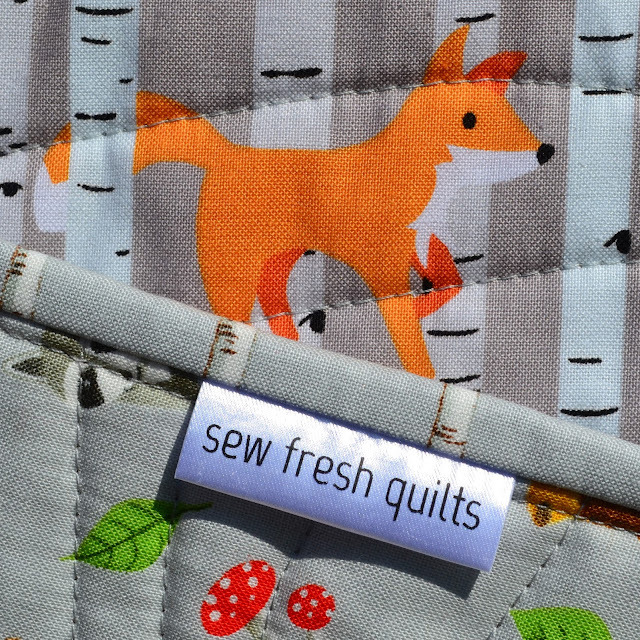 And I still had a little bit of fabric left over from making the Fox among the Birches quilts and from selling quilt kits for those in my Etsy shop. You can see my first Fox among the Birches here and the second one here. I have never made a strip quilt before. But have always wanted to. So this was the perfect time to take advantage of the fabrics I had left over. There was about 21" of Good Natured by Riley Blake Designs and about 18" of White Mandorla from Camelot Fabrics. I added in 6 strips of Kona Ash cut in 1.5" strips and 6 strips of Orange Dot from the Safari Collection by Northcott Fabrics. For the backing, I had 47" of the Animal Toss in Pebble from the Forest Friends collection for MODA. The coordinating binding is Birch Trees, also in Pebble. Because I still had a little of the binding fabric left over, and it was now looking so lonely, I decided to make a matching pillowcase. The pillowcase measures 14.5" x 26" and fits a 13" x 20" pillow form. Of course the quilting was performed using my walking foot to create organic wavy lines with Light Grey Omni from Superior Threads on top and a slightly darker grey thread in the bobbin. The Omni has been used for a lot of quilting and is almost completely finished! The "Foxy Strip" quilt finished at 42" x 46"
This set includes quilt, pillowcase and pillow insert and is now listed for sale in my shop here. when she returns in September. Remember those days at the fair spent going round and round on the Merry-Go-Round? I do!!! I have the instructions written. The full sized quilt blocks finish at 38" x 31" and a half sized block that finishes at 19" x 15.5" is also offered. There are three quilt sizes included: Mini - 21" x 18", Single - 42" x 35" and Double - 52" x 66" made using 2 blocks. This love of carousel horses has led me to come up with a new concept. And this has led me to consider making it a series. I also have the instructions written for the Deer and the Lion. BUT... now I am wondering if anyone would even be interested in making these. They are definitely different. And I think they would make great wall quilts. But for who? And then there is the saddle and rod that make them only suitable as Carousel rides. But they could be make without either or both. What is YOUR honest opinion??? 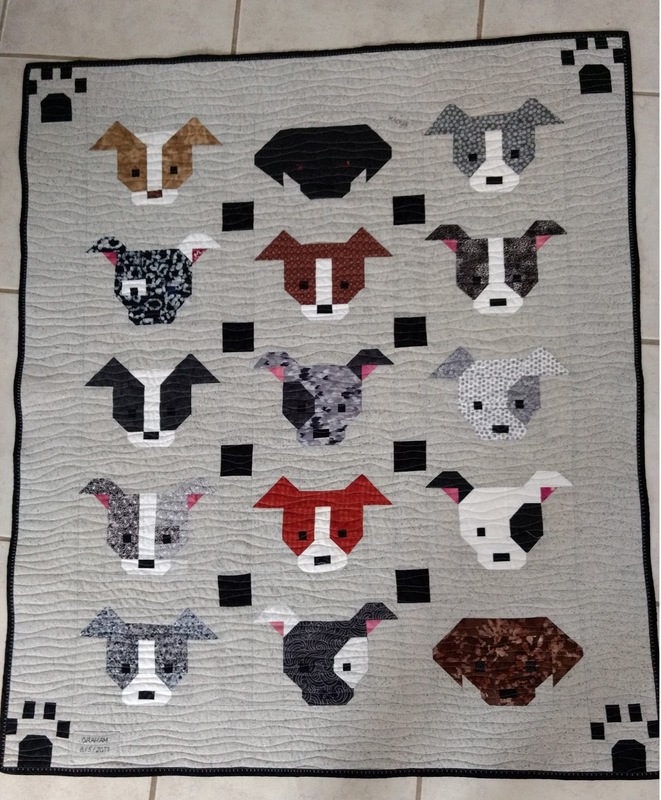 Last week I received an email from Sheryl who wrote, "Dear Lorna, I love the dog quilt pattern. I'm new to quilting but my dogs came out very nice (thank you so much) anyway I'm ready to quilt it and want to do this myself. I bought a stencil of just squiggly lines but not sure if you would quilt with these lines across the dogs. Can't tell how your quilts are done. Thank you"
As someone who did a lot of outline and echo quilting when I first began, I could understand Sheryl's reluctance to quilt across the dog blocks. So I encouraged her to go ahead and quilt right over them. I sent her a link to my Gallery Page to give her a chance to see that I use this method on all of my quilts. And I also mentioned that I do not use a stencil or mark any lines. I just use my walking foot and wiggle the quilt in waves to make random wavy lines. It was only three days later that Sheryl wrote back, sending photos, "I've finished my puppy dog quilt thanks to you quilting advise. It's for our new grandson and I love the backing - all puppies! Thank you again." I replied, "Oh my GOODNESS! I love your sweet doggies! The quilting looks fabulous and you found the perfect backing for this this quilt. I am so happy to see you used your imagination to made a couple of dogs with their ears folded down. And the paw print corner blocks are a fabulous way to add a border. Thank you so much for sending the photos, Sheryl. Would you consider allowing me to share this quilt with my readers providing I only use your first name?" Sheryl agreed, "Absolutely you can share my quilt. I changed the ears because my daughter that it's going to has a black lab. His head is a little boxy but that's all I could come up with. Thank you again. Your info inspired me." 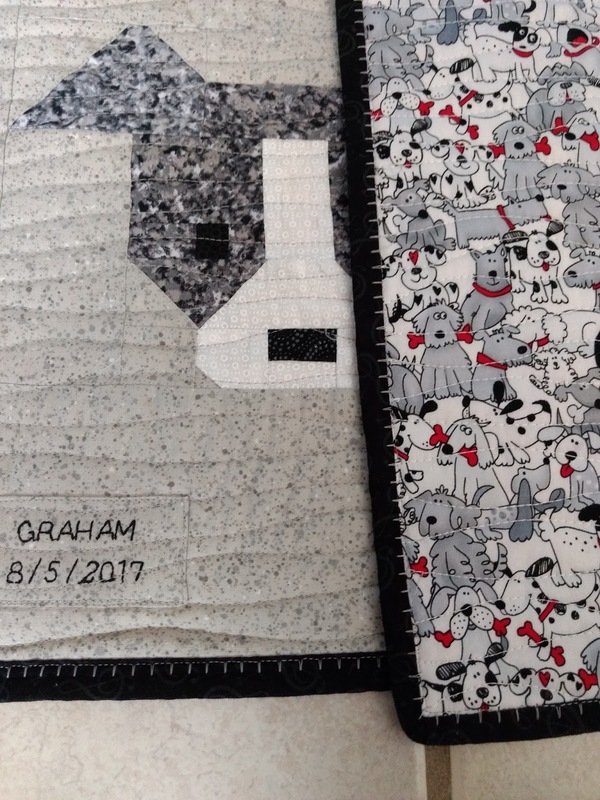 If you would like to make a quilt like Sheryl's, you can find the free Dog Gone Cute quilt along here or you can purchase the Dog Gone Cute pattern from my shop here. It's a great big giant Rainbow Unicorn!!! Last week I received a message in my Etsy shop from Anna. She was requesting a custom order and wrote, "Hi! I love your quilts and designs. 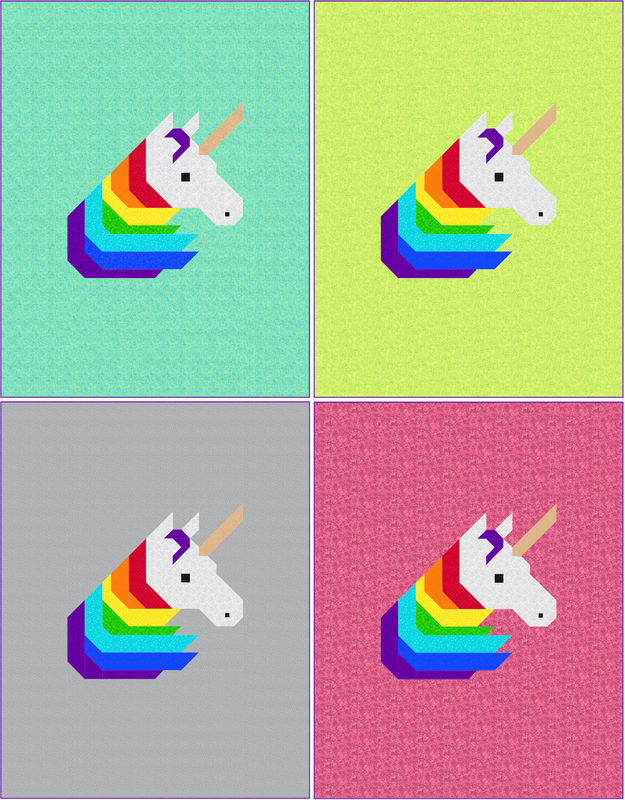 I was wondering if you could custom make me a unicorn quilt in a twin size. Thank you!" We conversed for a while, "What did you have in mind? Do you want the whole body of the unicorn or just the head? What size of quilt did you want - 70" x 90"? Can you give me a range of what you are willing to spend?" "I like just the head that you have for sale. I would like it to be on a light pink or light aqua or turquoise background. 70" x 90" would be perfect. Open to prices. I love quilts but haven't had the time to learn to make them." I went on to explain, "Using fabrics I have on hand would be less expensive for you. I got a good deal on these fabrics because I bought them by the bolt. If we have to purchase something for the background, fabric is about $15-$19 a yard. And you will need about 5 yards for the background. And 5 yards for the backing." So I sent the following mock ups, made using my EQ7 program. It has taken me a little practice to get the hang of the Electric Quilt program, but now that I have learned how to use it, I don't know what I'd do without it. It was easy to take the Rainbow Unicorn block that I had designed and put it in a layout for a twin size quilt. And then plugging in fabrics to audition was a breeze! Anna settled on the pink background option and choose the aqua for the backing. And I still had enough fabrics, left from making the smaller versions of the Rainbow Unicorn quilts I shared last week, to make this great big one. 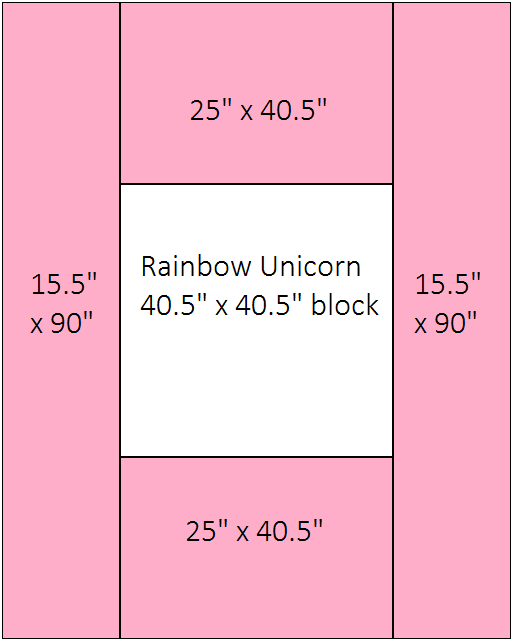 The Rainbow Unicorn pattern provides instructions for piecing blocks in a 10", 20" and 40" square size, plus borders. So for this quilt, I omitted the borders while cutting, and instead drew up a diagram similar to this one, to calculate the fabric needed to place the block in a 70" x 90" setting. Unfortunately, I goofed in my initial calculation and made my top and bottom pieces 23" x 40.5" instead of 25" x 40.5", so my length of the quilt ended up being short. (I think I must have been fixated on the finished size of the block that included the borders.) Then when I was cutting my batting, I made another error and did not make it wide enough. (I think I must not have had enough coffee.) So my finished quilt ended up being 68" x 86". Sorta close to 70" x 90". All of the fabrics used in this quilt were from Northcott Fabrics, most from the Artisan Spirit collection, so they all play nicely together. I have been working hard on using fabrics found in my stash this year and this custom quilt sure helped me to make a hefty dent! The quilting was performed using my walking foot to create organic wavy lines with white thread both on top and in the bobbin. And I like how the quilting stands out a little more than if I had used a matching pink. Plus it blends well with all the other colours too, so we don't have pink stripes running across that white unicorn face. I normally cut my binding strips while doing all the other cutting. But this time I waited until the top was pieced to allow some time for thought. In the mock ups, I had used the purple to show the binding, but I decided to use the background fabric and blend in rather than outline. And I think the hot pink looks great against that aqua print used for the backing. The twin size "Rainbow Unicorn" quilt finished at 68" x 86"
You can read about my Rainbow Unicorn mini quilts here. The Rainbow Unicorn pattern provides instructions for three sizes. The blocks are 10" 20" and 40" square and finish at 12", 24" and 48" square including the borders. The Rainbow Unicorn also NOW comes with instructions to make a solid horn or a spiral horn. 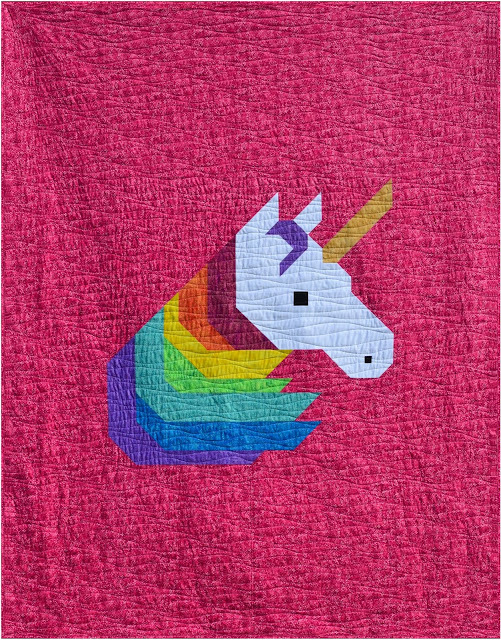 You can find the Rainbow Unicorn pdf pattern here in my shop. 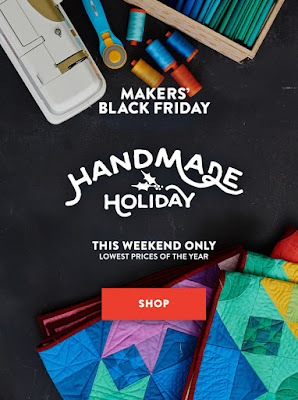 The Craftsy event you’ve been waiting for has finally arrived! 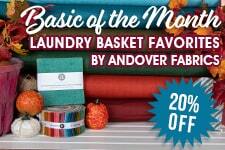 This is your chance to score the lowest prices of the year on your favorite fabric, kits, and supplies. Now get to it! Fat Quarter Shop 20% off Essentially Yours by Moda Fabrics in August.